Fulton Leadership University, a nine-month leadership program sponsored by the Fulton County Economic Development Corporation for up-and-coming leaders in Fulton County, held its first capstone project March 9 at the Fulton County Welcome Center in Wauseon. 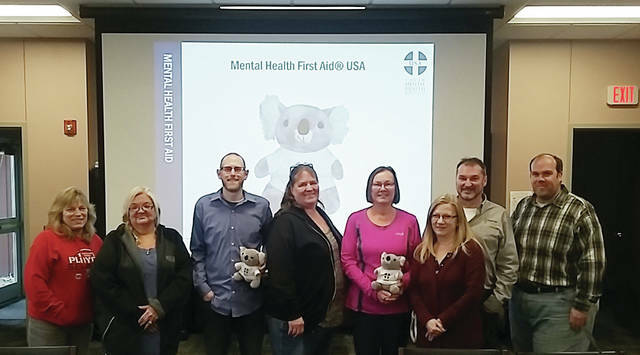 Pete Dinius of Rupp Seeds, Zach Hahn of H&R Block, Chris Homan of The Mannik and Smith Group, and Kayla Miller of the Fulton County OSU Extension hosted the Maumee Valley Guidance Center to deliver Youth Mental Health First Aid training; eight adults were certified . Dr. Christopher Harben of Penn State University was selected to instruct the leadership program’s inaugural class of 14 members, who live and work in the area. The group gathers monthly in various locations and tours a host facility. Dr. Harben facilitates discussion regarding leadership styles, management strategies, and effective communication. Classes conclude in May with a graduation ceremony. https://www.fcnews.org/wp-content/uploads/sites/45/2019/03/web1_FCEDC-photo.jpgFulton Leadership University, a nine-month leadership program sponsored by the Fulton County Economic Development Corporation for up-and-coming leaders in Fulton County, held its first capstone project March 9 at the Fulton County Welcome Center in Wauseon. Pete Dinius of Rupp Seeds, Zach Hahn of H&R Block, Chris Homan of The Mannik and Smith Group, and Kayla Miller of the Fulton County OSU Extension hosted the Maumee Valley Guidance Center to deliver Youth Mental Health First Aid training; eight adults were certified . Dr. Christopher Harben of Penn State University was selected to instruct the leadership program’s inaugural class of 14 members, who live and work in the area. The group gathers monthly in various locations and tours a host facility. Dr. Harben facilitates discussion regarding leadership styles, management strategies, and effective communication. Classes conclude in May with a graduation ceremony.